Leading Me Home: Christ is Risen! Christ is risen! He is risen indeed!! At least in the church I grew up in, it's not Easter unless you exclaim those words! Wow! It's been a weekend full of family, busyness and Jesus. (At least I love two of the three of those things!) 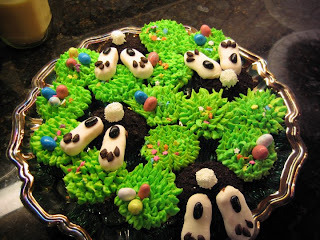 And I have to take a moment and show off my latest cupcake creations for our Easter lunch today. 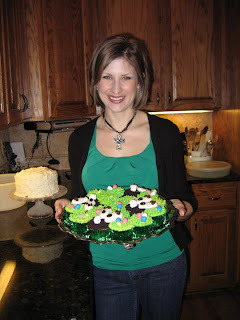 I so wish I had more time (and excuses) to make fun cupcakes!! Forget the bunny trail!!! Peter Cottontail is hoppin' back down into that bunny hole! I just wish I was as photogenic as those cupcakes!!! I am discovering so many things about myself as I read Beth Moore's "So Long, Insecurity." The Lord is making known to me these insecurities that I have buried so deep within myself that they have become part of the fabric of who I am. (If you're reading the book....page 128.....I'm embarassed to say it, but I have SOO been that woman!) As I read, I hate that I am able to identify with so many stories of insecurity. How can I truly live the victorious, spirit-filled life when I am this insecure?? The answer is - I can't. Lord, rid me of these insecurities! I feel like I have spent more time asking Him to rid me of things lately than I have asked Him to add things to my life. In another study I'm finishing up, we spent this last lesson reading about the ugly root of bitterness. Now, I am not a bitter person. In fact, I tend to give grace to the point of being stupid. And there are many a story to vouch for that . Oh, but I have a root of bitterness right now, and I cannot get rid of it! And while this bitterness is manifesting itself, my heart still aches for the same relationship my bitterness is toward. How can I feel bitter towards and still long for the same relationship?! Is that even possible?? Apparently so. So my journey in this season of singledom continues. I am praying the Lord would make His lessons clear (JUST SHOW ME THE BLUEPRINTS!!!) and He would give me a heart like His.